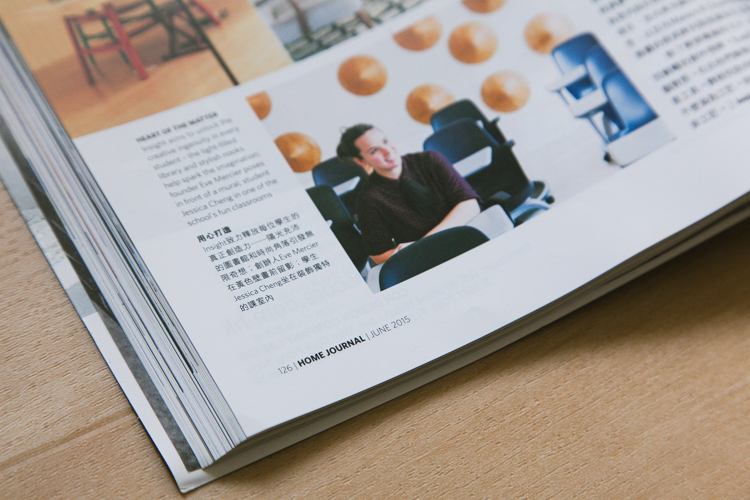 What a pleasure to work with Home Journal again for their June issue. This time I got a chance to photograph the amazing architecture and interiors of four schools throughout Hong Kong that offer design courses, and got to meet some key instructors and students from these programs. 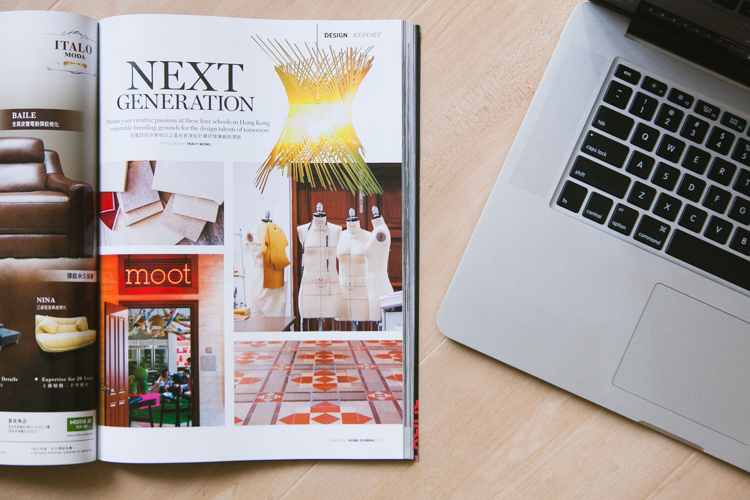 Go pick up a copy of the magazine and check out the “Next Generation” article! 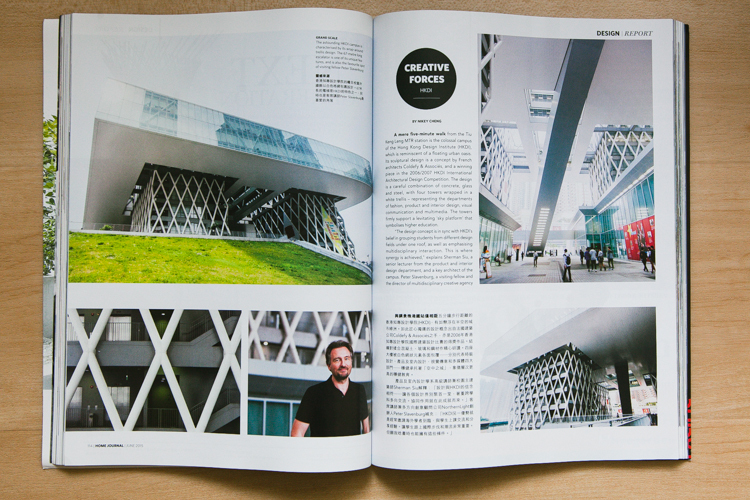 The first school introduced in the article was the Hong Kong Design Institute (HKDI). Located Tseung Kwan O in the New Territories, the campus really stood out from its primarily residential surroundings, with the four latticed buildings connected by foot bridges and a glass structure that seemed to float in mid-air. It’s hard to believe this marvelous campus was in Hong Kong! During my visits my favorite architectural feature at HKDI was the long escalator that connected the 1st to 7th floors. It cut through the open air areas and was a great interest point looking up from ground floor and looking down from the roof. 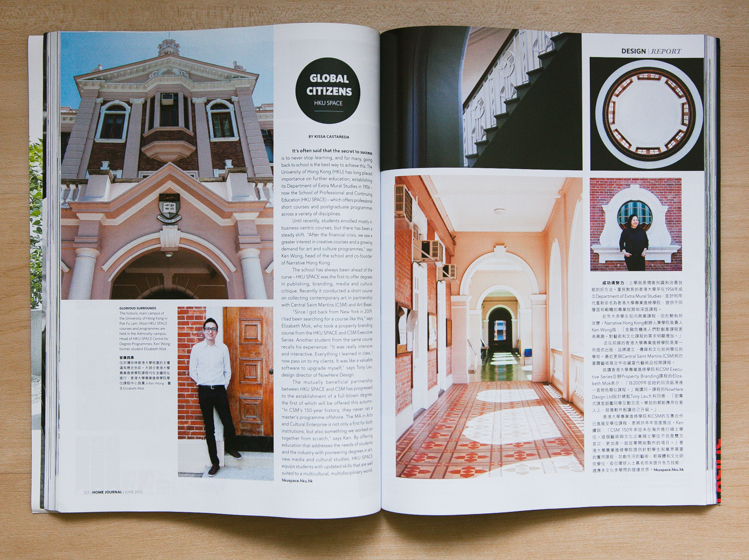 A contrast to HKDI’s newly built campus, Savannah College of Art and Design (SCAD) revitalized the West Kowloon Magistracy building, keeping many of the historic characteristics. Stepping into the SCAD campus in Sham Shui Po, one seemed to be in a strange time warp, as young students lounged in colorful, modern chairs next to the grand staircase and courtrooms-turned-lecture-halls. Holding cells for prisoners were converted into offices, though their original iron gates remained. I felt a tinge of jealousy when touring the building, wishing my school buildings had been so full of inspiration and positive energy! Though I grew up on Hong Kong Island, I am ashamed to say that I had never visited the Hong Kong University (HKU) campus until this photography assignment. HKU is Hong Kong’s oldest university, established in 1911, and one could feel its sense of historical significance while roaming through the Main Building. The arched hallways, circular windows, and tall pillars were the perfect elements for me to frame portraits with! 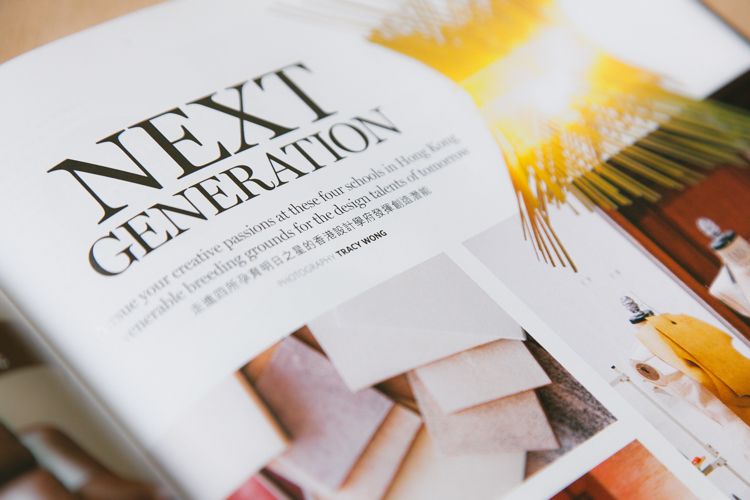 Last but definitely not least, Insight School of Interior Design is the first interior design school in Hong Kong, and within its first year of establishment, it has already received much recognition in the industry. 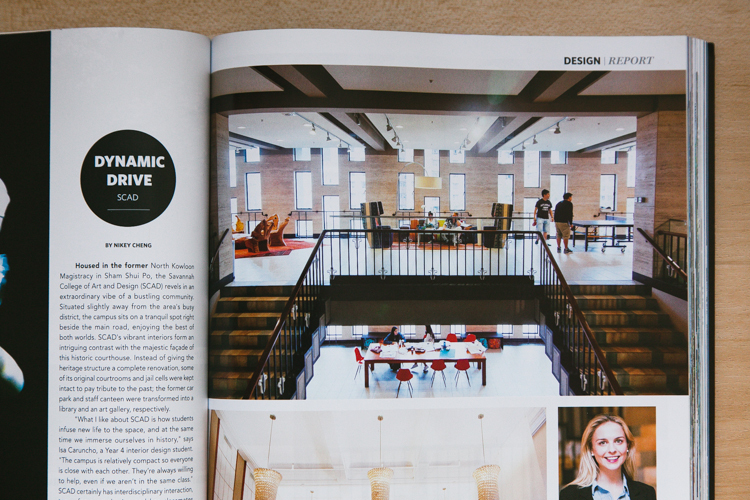 In terms of physical size, Insight may not top the rest of the schools in this article in Home Journal, but my sense of amazement at the space was just as great when I arrived for the photoshoot. Designed by its founder Eve Mercier, the Insight campus was such a refreshing escape from its industrial surroundings. I loved the light-filled library, glamorous details in the furnishings and on the walls, fun play on colors… The list goes on – there really was no shortage of beautiful scenes for me to photograph! 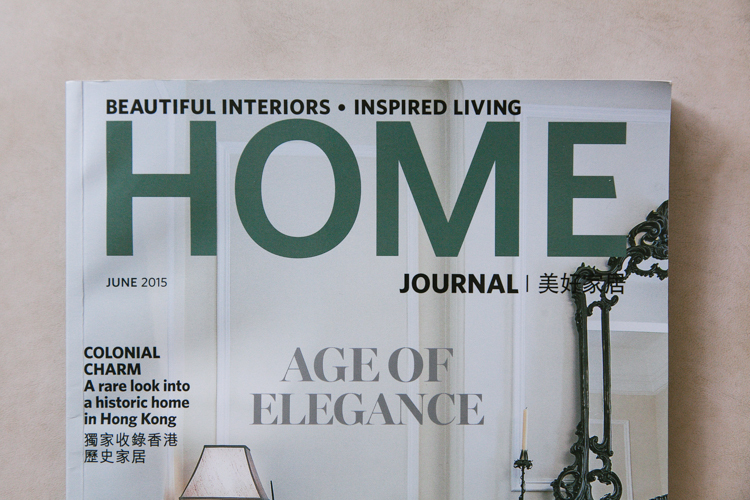 It was such an honor to work with the editors of Home Journal again, and to meet so many interesting faculty members and students through the assignment. I’m truly looking forward to photographing more “archiportraits” again in the near future!